This piece dives right into it’s subject which is plainly stated in the title, Chesterton makes certain to give examples to other genres before seriously laying into the matter of point, but once doing so, doesn’t let up, giving specific reasons to support his side throughout the article. Chesterton starts by describing different sides of the spectrum of the genre of focus, then lands on chivalry and religion at least being about their respective subjects whilst the genre of success is about “nothing”. He continues by relating these texts claim to tell of how men can succeed in anything, but the writers themselves not even being able to succeed in doing their job of writing about the subject correctly. Chesterton states the idea of success doesn’t exist, but then allows this is because success is in anything if one looks at the available examples given: “Any live man has succeeded in living; any dead man may have succeeded in committing suicide.” , as well as listing a couple others. He goes on to explain how writers of success try to convince those who read their subject matter can be helped to succeed in their specific area of need, but how if it were any other person writing about a distinct subject and didn’t actually deliver in seeming to know about what they were writing of, the piece would certainly not be published. Chesterton reiterates his argument of people who write of success and those who’ve obtained it don’t have the knowledge of why this is so. He then informs of two ways one is successful, one of which most (hopefully) would rather choose, but some would be satisfied with the underhanded way of procuring the desired gem. We learn by Chesterton’s deductions of how one would usually try to go about learning a specific subject, those including the seeker being a natural, a cheat or acquiring books on the various subjects relating to the talent wanted, but the idea of going straight for a book on success due to the general statements within such a text shouldn’t be at the forefront of one’s mind. We get another couple of examples of how a book on success would go about giving “advice” on how to attain triumph over one’s various endeavors, but how empty they would seem since it would lack detailed strategies about how one could potentially go about this. Chesterton then shares an article title of success about Lord Rothschild which he found odd and entertaining going on to add some article excerpts after, including a description of Vanderbilt’s background, he having been a millionaire and his successes, this obvious selection was given due to its sober evaluation of how whilst one couldn’t necessarily find success the same way, it gave the optimism it was still possible for others, Chesterton listing this article as, “…the horrible mysticism of money.” He perceives the author was in awe of Vanderbilt’s ability to have been given such success, but was only giving a fanboy list of Vanderbilt’s achievements rather than truly knowing how he’d become one of the few and the sparkling and celebrating Vanderbilt’s mysterious wealth. Chesterton then debunks another statement by the same author which brings to light his careful cover up of facts to support his theory on those who were able to succeed, showing some mentioned, didn’t stay successful. Chesterton then admits how whilst he’d read about the figures mentioned and knowing he might not be able to fall into success easily, he admitted to also having not tried, preferring to focus on other more attainable pleasures. He begins to wind down with statements of how he doesn’t deny others’ successes, but had felt they may have been keeping something hidden and hoping people would soon come to disdain these success books as they should (which people still struggle with today, obviously) since all it seems to do is educate people on how to be conceited and give a false sense of experience. 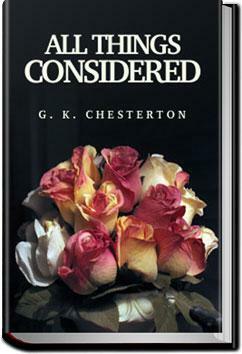 Chesterton ends with how some qualities should be preferred over the ones made to seem important, for instance the want of doing good work for not the possibility of becoming rich, but for being good at one’s job, he ending with the question of what could happen to those who are encouraged to attain greatness through their indecency rather than morality. I quite enjoyed Chesterton’s flow and giving entertaining examples as to the absurdity of what authors of success books try to do with their “work”. There didn’t seem to be any arguments on the subject since I can relate to his viewpoint on success or D.I.Y. books. Chesterton set out to describe the lack of facts to back up what success writers publish, and I believe he succeeded (gold star, Chesterton, already ahead of the game). He sets out his arguments with viable representations of the facts and regardless of how long ago it was written, it still holds up even by today’s standards. Whilst this is just one article from a collection, I may some day decide to read the rest, but for now I’ll be glad to continue my reading of him with Father Brown.